Living in South London, I’ve had no previous experience as a farmer. I’m also vegetarian and I’ve never worn a pair of wellies in my life. But over the last few years, I’ve gained some knowledge about the price of wheat, what hens really want and how tractors are different in quality – not just because the red one looks pretty. I wouldn’t say I’m overly qualified to nail the utter specifics of any farming game, but I’ve played near on every single farm-based experience that has released over the last few years, and for that reason alone, feel I’m reasonably well placed to give some serious insight into Farming Simulator 19 – the latest in the long line of farming sims. So how does the newest instalment play out? Is it all about the golden fields of wheat, or should we be expecting a mud bath where nothing grows? Farming Simulator 19 hits you from the off – mainly because as it loads up there’s a little cut scene that shows a young farmer and his dog, and what looks like the barn from Far Cry 5. Anything that replicates that game is on to a winner in my eyes. Before we get down and dirty though, there is the opportunity to take in some tutorials; I would advise you to do this if you’re a newcomer to the series, as they give a decent insight into the basics that you’re going to need to utilise in the farming world. From there though you can pretty much kick on with the career mode, from which you have three choices depending on how confident a farmer you are – the new farmer which gives you some land and guides you through the basics, or that of the mid-level farmer where you start with some money, but have no equipment and buildings so can design your own farm and how you want it to be. Then there’s the last level – seriously limited funds, no land nor equipment and prices that you are quoted for any interesting products are high. I like to call this the ‘end of the world’ scenario… only the best farmers should go here. You get to take control of your farm with whatever settings you wish and here you have a choice of the good old American heartland, or a German farmstead. Whatever you choose though, you’re thrown straight away into the world of hard graft and the need to earn big bucks, allowing you to gain access to bigger assets and more machines. I have previously found that other farm games have perhaps included a bit more hand holding than Farming Simulator 19 does, and many may think they are being dropped into the thick of it a bit too harshly, but for old hands of series it won’t matter; they’ll be plowing and planting before us mere farming mortals can even get on a tractor. 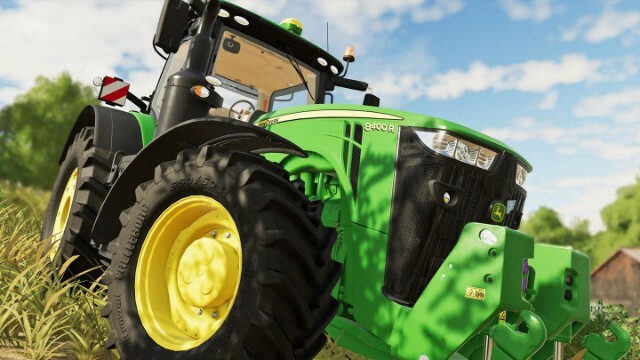 As you may expect, the gameplay centres around your farm and you are given a number of fields to start messing around with, and – depending on your difficulty level – some machines. There is also a town that has other farms and businesses already set up, allowing you to get in on the action, trying to nail down jobs in order to earn cold hard cash, taking part in some contracts for farm work or delivering stuff for a construction site for example. 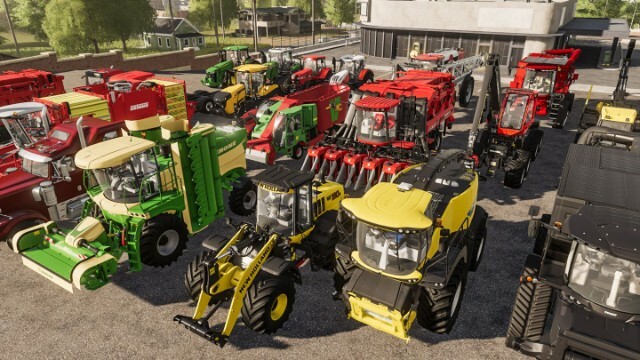 It is once you’ve partaken in some of these which Farming Simulator 19 starts to move forward, letting you use that money to buy some of the 300 odd vehicles on offer in the game. You’ll find that there are numerous types of tractors, trailers, cutters, combines, seed planters, forklifts and more ready for action, with real world names like John Deere, the largest agriculture machinery company in the world being used, alongside beasts from the likes of Case IH, New Holland, Challenger, Fendt, Massey Ferguson, Valtra, Krone, Deutz-Fahr and many more. They all look great and for the farming fanatics out there, probably come across as very accurate – I’m not one that is completely up to speed with the latest farming vehicles, but they all look very decent and so that is good enough for me. There’s a great new feature that allows you to immediately switch between all your vehicles with a touch of the button too, even the train, which is a brilliant addition and makes this farming gig a whole ton easier. 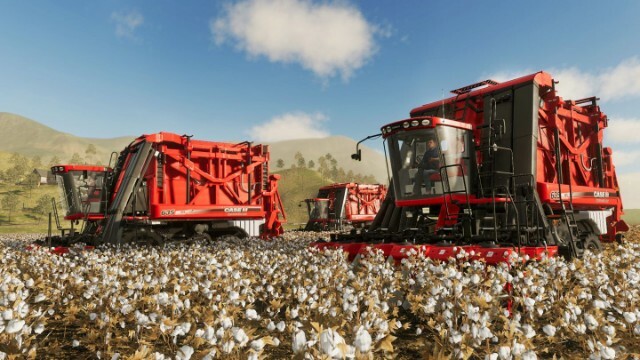 There really is only so much the developers of farming titles can do with the genre as a whole and with Farming Simulator 19 you’ll find that the gameplay hasn’t changed much over the years; whether you like farming games or not will depend on whether it’s something you have interest in or not. You’re not suddenly going to find yourself falling for the whole idea with this edition if you haven’t previously, as there is a lot of monotonous work moving your vehicles up and down the fields, hiring workers and getting immersed in the slog of the action. It must be said though that the vehicles certainly seem to be much more responsive this time around and are definitely a lot faster; but maybe I’m just getting used to life in the country after taking these games in for many a year. 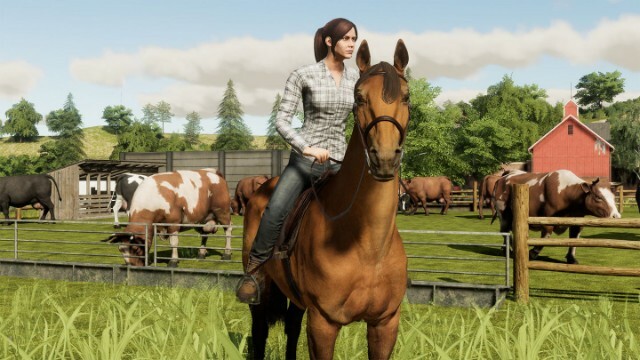 Animal husbandry is much more detailed in Farming Simulator 19 and should it be an area you wish to focus on, you can now breed, individually name, and ride horses to your heart’s content, alongside tending to the needs of pigs, cows, sheep and chickens too. There are new crops included too, with cotton and oats available to be reaped this time – provided you have enough cash to bag the right machines to help you with the job. The multiplayer element is in place as well, with the ability to cooperatively care for your farm with friends and enemies. This is a great mode which sees up to six players running with their own vehicles and individual bank accounts, but sharing in the duties that the farm world brings. The biggest upgrade found in Farming Simulator 19 though is on the visual side. The developers have thrown in a massive upgrade to their engine and it shows on the screen. The environments are lush and the detail down to the tiniest grain of corn is impressive. There are nice towns to walk around, gallop a horse through, or power round like a manic in a combine harvester. I never thought I’d be able to say this about a farming game, but it feels much more like a real world and I very much appreciate the upgrades that are in place. The audios aren’t quite as impressive and even though the sound is fine, you’ll need to like the sounds of dirty big machines to really find much enjoyment. Thankfully there’s a radio that lets you in on some tunes with stations playing country rock and European house music – you always need some banging house tunes playing whilst you plow. There are two ways you can look at any farming game – should it be looked at as a ‘game’ or as a ‘way of life’ for those who have enjoyed farming sims before. For me, the visuals, gameplay tweaks and huge array of sandbox elements to have fun with put Farming Simulator 19 right up there in the farming entertainment world. I like the inclusion of multiplayer elements and if you can persuade friends to hop aboard your tractor instead of having to rely on randoms from around the globe, can be a lot of fun. However, the lack of hand-holding hurts, and inclusion of more quest-based missions – a bit like Real Farming did previously – is something this instalment could do with, because it is very easy to get lost and be left unfocused. For newcomers, it’s a hard one to recommend, because the whole thing can take its toll at times, but if you are already accustomed to farm life, then this is as good as it gets. Previous articleThe Gaming Hub Podcast Episode 134 – PlayStation Skipping E3 and a New Xbox One Console?